The 2018 Small Image Show at Buenaventura Gallery opens Saturday, November 17, with a reception from 6-8 p.m. 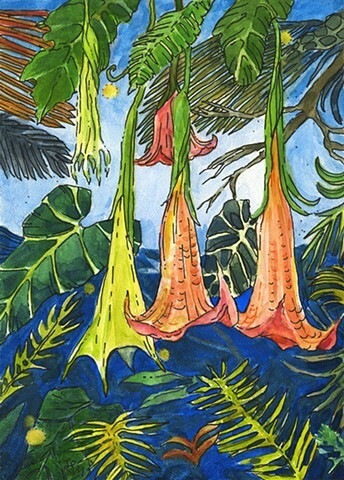 I have two paintings in this exhibit; "Brugmansia and Orbs" and "Thatched Roof Hollyhocks". The show runs through December. The artworks cannot be larger than 14 inches in any direction, which makes for a lot of charmingly small and affordable artworks. My etsy shop is Lisa Skyheart Marshall, and has my small paintings and mixed media work for sale in it. For these mixed media pieces I use painting, collage and printing using blocks designed and cut by me in my studio. My latest watercolor+ink artwork is now available in the shop. Please visit the etsy shop, and if you see something you like, click the "like" or heart button, this gives me feedback on what you like! If you love it, put it in your cart and buy it! Originals don't last long. In 2016 I was honored to be commissioned to paint two cabinet doors for the Garden Shop at Lotusland in Santa Barbara, California. Lotusland is a wonderful place to visit, I highly recommend making a reservation and experiencing this beautiful estate in Montecito. While there, be sure to visit the Garden Shop and check out the cabinet doors I painted for the shop. The photo I'm showing here shows just one of the two doors. The Garden shop carries unique and wonderful items, many are handcrafted by local and international artists and artisans, as well as garden items and plants. 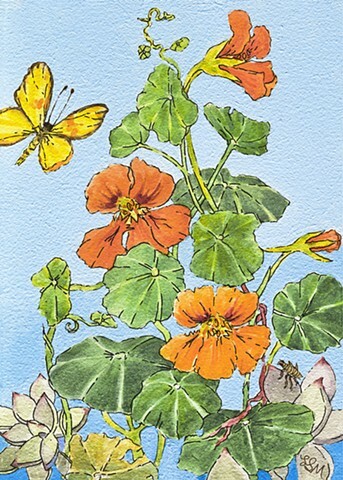 Sales in the shop or on their website benefit Lotusland.